Fan Forum > TV Shows - Present > NCIS Franchise > NCIS Birthday Thread #2 - Happy Birthday everyone born in April! NCIS Birthday Thread #2 - Happy Birthday everyone born in April! list, just reply telling us your birthday so we can add it for you. 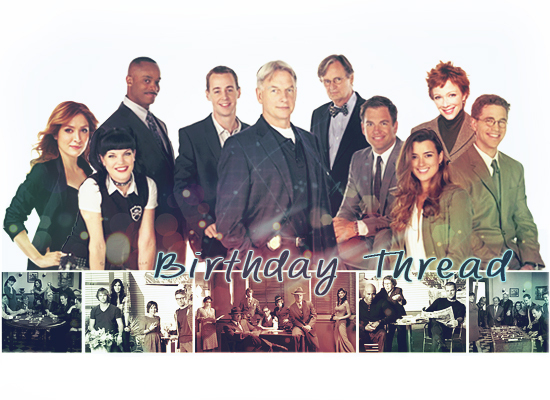 Happy birthday to the following fans and all the rest of the NCIS fans celebrating their birthdays this month too! Darn it! I came in here yesterday to post this and completely forgot! Thanks for posting the birthdays! Happy birthday to all! Happy birthday to the following fan and all the rest of the NCIS fans celebrating their birthdays this month too! Happy birthday to all! There are a lot of cast member birthdays this month!